Tom Nolan was prepping for a conference in a city he had never visited. After hours of research on the best restaurants, sightseeing opportunities, and optimal travel routes, he was ready to go. However, he soon found the map technology available to him to be lacking. Aggregating the myriad locations he had discovered onto one map was more than difficult, it was impossible. Nolan was left with no alternative but to map one location, clear it, and repeat ad nauseam. On his return, Nolan was struck with an idea: develop a mapping app that lets users create custom maps with multiple locations that can be shared via social networks. In that moment, Plotter was born, not of desire, but of necessity, and Nolan’s intense journey to bring his idea to fruition began. He assembled a crack team of Chad Milburn, Tim Zeller, and Chris Jungjohann. The pace was grueling, the work mountainous. SXSW, in Austin, was fast approaching, and the team wanted to debut Plotter: failure was not an option. When the day finally came, Plotter crushed the competition and won the grand prize at the SXSW Accelerator in the Social Technologies category. Plotter went from wire framing to live app in four and one-half months. 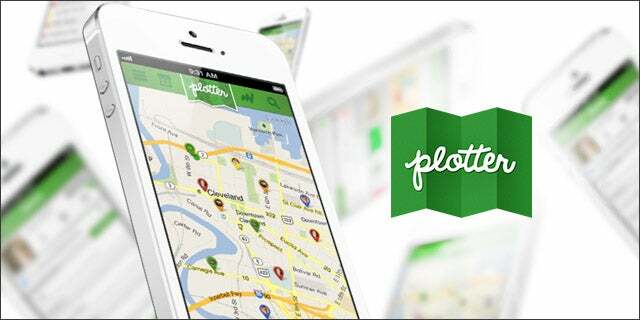 Plotter is the first social network for maps. It has the standard search and direction functions of other mapping apps, but it adds an entirely new host of capabilities to the platform aside from plotting multiple locations at once. From the Map Room, users can plot multiple points, but they can also crowdsource their maps, upload current maps, and discover already curated maps from friends and experts. “First and foremost, people are using the app for travel and trip planning,” says Nolan. Plotter’s platform makes it easy to map a trip in advance and collaborate with friends and family on location recommendations. However, Plotter is not only relegated to trip planning activities. Let’s say, for example, you are searching for a new home. It would be easy, with Plotter, to create one map with all the addresses you are going to visit. The social networking side of things, then, allows friends, family, and even your real estate agent, to access your map and provide input in real-time. “There is, simply put, no mobile mapping app in existence that easily lets people create and organize maps with multiple locations,” explains Nolan. While Apple and Google both have stellar mapping apps, the Plotter team believes these companies are only scratching the surface. The opportunity to create, share, and discover on a more full-featured mapping app is a utility a lot of people need and will utilize in their daily lives. There are high hopes for Plotter moving forward. Nolan and his team have worked to enhance the user interface as well as initiated a plan to aggressively jump to Android and Connected Car platforms. “We have many other ideas and strategic priorities,” says Nolan, “but we cannot reveal everything just yet.” But if you use your imagination, you can see that the possibilities with Plotter are wide open. Plotter was featured at Tech Cocktail’s SXSW mixer.